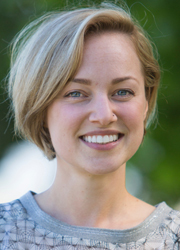 Caitlin Celinski - compassionate and empathetic counsellor on Fraser St.
My therapeutic approach is grounded in the belief that we all have the capacity for change and continual growth. I seek to empower you to become an active participant in your life, rather than a passive spectator, so that you can make changes that improve your quality of life. Therapy can be a place for you to express yourself in a safe setting, gain insight into how to move through whatever you are struggling with, and experience a non-judgmental and compassionate connection. My aim as a therapist is to be by your side as you take on this journey of self-discovery and growth. I work to create a comfortable environment and secure relationship with each client. This allows me to gently challenge you to push beyond your comfort zone and address your difficulties in a new way, while feeling safe and supported. My therapeutic style is flexible and grounded in collaboration, adapting to best fit each client’s unique needs. I often incorporate elements of Emotion Focused, Cognitive Behavioural, and Mindfulness therapies. As a member of the team at Honey + Garlic, I bring with me over seven years of experience working in the mental health field. I have worked extensively with individuals with severe and persistent mental health concerns, including psychosis, drug dependence, and suicidality. I have also helped clients manage and overcome depression, anxiety, stress, life transitions, relationship/family difficulties, sexual identity issues, and trauma. I work with young adults and adults, both individuals and couples. Beyond my counselling practice, I love animals. I am especially fond of dogs – I feel they have a remarkable ability to form meaningful connections with us and to soothe us as we work through challenging phases in our lives. My puppy, Nikka, has started to join me in sessions (when a client consents or requests it). She is four months old (as of April 2017) and loves to meet new friends! I am happy to have a free 15-minute phone consultation to answer any questions you may have about the counselling process or to explore whether you feel we would be a good fit. To book an appointment, call Honey + Garlic at 604-879-5023 or email me at caitlin.celinski@honeyandgarlic.ca. Or, for more information, please visit my website at Caitlin Celinski. I look forward to connecting with you!